RIVERHEAD, NY—On December 30, 1933, more than 2,000 people attended the Suffolk Theater’s grand opening. Local media declared it “The Radio City Music Hall of Long Island.” The last remaining movie house built by architect R. Thomas Short, and the last remaining large art deco theater on Long Island, the Suffolk Theater entertained generations of moviegoers until closing its doors in 1987. Recently reopened after a lengthy renovation project, the Suffolk Theater is a multi-use dinner theater with flexible seating, digital projection, and a surround sound system featuring Renkus-Heinz PNX and TRX Series loudspeakers. The building sat empty until 2005, when Dianne and Bob Castaldi purchased it, with a vision of creating a modern performing arts center. 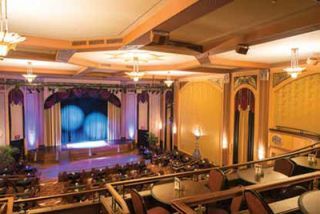 Recently reopened after a lengthy renovation project, the venue retains much of its interior décor and charm, while now presenting as a multi-use dinner theater with flexible seating, digital projection, and a surround sound system featuring Renkus-Heinz PNX and TRX Series loudspeakers. The theater’s original raked seating was removed and replaced with a multi-tiered design that allows for varied configurations of tables and chairs, accommodating everything from concerts and performances to dinner theater or movie screenings. Allyn chose a pair of Renkus-Heinz PNX121 two-way 12-inch loudspeakers for the main system, with two CFX218 subwoofers for low-frequency reinforcement. Ten TRX62 boxes comprise the secondary surround system, as well as providing coverage to the upper and under balcony areas. The boxes were custom painted to blend seamlessly with the venue’s walls. The system was installed by Young Equipment Sales of Hauppauge, NY, under the supervision of Charles Stursberg, director of audiovisual theatrical lighting and theatrical rigging sales.